Dr. A. B. Judson was the Sanitarian of New York State during the early 1870s. His primary contribution to his field was like that of John Peters and numerous other medical climatologists and topographers for the time. By the 1870s, scientists had developed enough evidence to hint at some “germ” related cause for disease, which had yet to be visualized and identified. The invisible nature of this pathogen made it open territory for numerous writers to lay claim to as they attempted to predict what this “thing” was going to be. There had already been decades of writing produced about the “germ”, something that caused diseases and could be kept away from potential victims by way of cleaning and sanitation activities. It was also mentioned in relation to the common work “filth” in many of the writings for this time, a way in which physicians and sanitarium officers were able to described those features which differentiated the healthy from the unhealthy, the protected from the potentially pathogenic, the socially correct hygienic ways of living from the unwanted and unappealing unhygienic way of living, and at times, the rich from the poor. Without the definition of the true germs for most diseases yet understood and identified, it was up to the hygienists and sanitation officers to keep the local people free from unwanted diseases. By the 1870s, physicians had determined the two behaviors of disease spatially–endemic versus epidemic. The endemic disease patterns were inherent to a given region due to its climate, topography, geology, the chemistry of its soil, rocks and water, pretty much everything existing within the local environment in living and non-living form. Local biological materials related to living organisms were at times related to disease, but more so once they were no longer living materials, but instead remaining present in the form of decaying materials that added to the stench of the places they occupied, and increased the non-hygienic nature of the natural world around particular living spaces. To many scientists it was these decaying materials that caused the “miasma” that led to disease development, and particular regions with endemic disease patterns were more susceptible to certain diseases due to the relationships that existed between these different parts of the natural world. The notion of epidemic diseases added several concepts to the endemic nature of diseases that were hard to identify, describe, relate to other diseases, or otherwise fully comprehend. How is it that some disease patterns have to be brought in to cause particular fever patterns, whereas other fever patterns are inherent to the natural setting around? 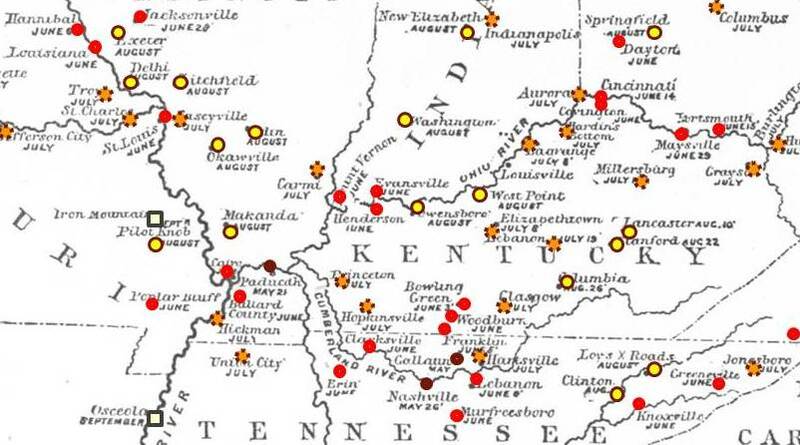 The yellow fever with its black and bilious states behaved quite differently from the fever associated with influenza, or with the endemic nature of local swamps for much of the year. The ship fever that struck mostly the port settings never seemed to migrate far from this nidus, whereas the spotted fever managed to erupt more in the outskirts of towns first, and from there make its way towards to shores and more active shipping neighborhoods. Then there were these fevers that had absolutely no previously known cause, that erupted first on the ships and from the ports managed to make their way inland every where people went, either on the same boat or by taking another much smaller passenger boat inland. It was the complexity of the fever as a primary symptom but labelled and conisdered to be a form of disease that distracted the medical profession from being able to see the possibility of the invisible cause and understand its full nature (or natures). The knowledge of the animalcule for more than a half century did little to make physicians take a more aggressive look at the invisible microscopic world, in an attempt to add a new cause for disease to the popular belief system for the time. When we go through the 1873 to 1878 writings on disease, it is important to note that this is the transition period for when the germ theory was replaced by the bacterial theory of disease. But the emphasis during this time was not on bacteria at all, but more so on human behaviors–how to live a hygienic life. “Filth” was the enemy, for wahtever reason, for whatever pathogen living a life of “filth” could produce. Throughout the writings for this period, of which three stand out, there are numerous words used to define what the pathogen for disease was. The terms “germ”, “poison”, “animalcule” and miasma are used just as commonly as other objects describing physical substances mentally, and often rarely with any true appearances that can be formed due to the unknown nature of this pathogenic substance. “Contagion” was what anyone wanted to describe it as and assign a name to. No one knew what was causing disease in nature, but everyone knew there was something out there. This means that many of the writings about the bacterium are verbalized only in theory. It was already being promoted that the “contagion” responsible for disease was a bacterium, but in these writings we see the expressions of medical climatologists and topographers disputing this theory. In the case of Max Pettenkoffer, a German doctor recognized worldwide for his thoeires of disease related to soil condition and physical and chemical structure (Pettenkoffer stated there was this third substance unidentified in soil that caused disease, chemical or gaseous in nature), to conform somewhat with the growing interests in bacteria and disease, he accepted this philosophy partially, offering it up in his writings as an addition to his own theories for disease already published out there. Pettenkoffer’s writing implied that in the end, even if this philosophy was correct, that soil still had those physical features and qualities that were responsible for disease, and no new theory was going to change his original theory about how soil could be the cause for disease due to non-biological agents. 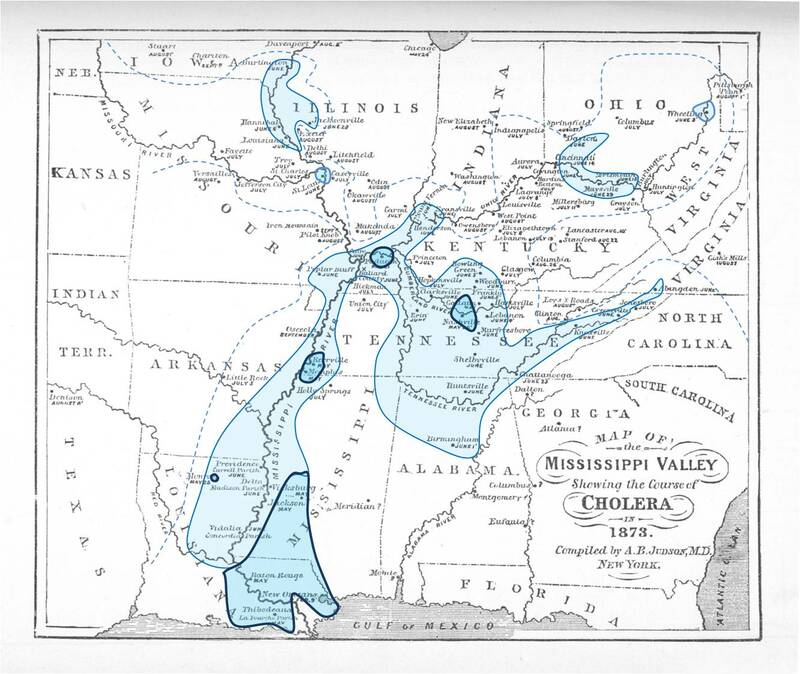 With Judson’s map, the association of cholera diffusion with both contagion and effluvium or miasmatic features is immediately clear. The initiation process for the disease displays linear movement along well define water-related transportation routes. In the minds of the medical topographers, this makes the disease appear as though its is related to water features. To the medical climatologists, the fact that there are some temporal (seasonal climate, monthly average temperature) features existing as well, the notion that latitude and weather/climate play a role cane be argued. But the extreme linearity of the first two to three months of disease migration (not diffusion really) suggests this disease has some very specific non-aerial feature involved in its migration process. The final stage of the disease migration entails the transfer of choelra from shipping ports and heavily populated river and streamside area into the less densely populated rural settings. Water is still a requirement for the disease, so even though it no longer follows rivers and other waterways, it tends to display itself in places where people live, which as a rule tend to be next to water sources like lakes, ponds, manmade water bodies, and even swamps. This proximity to water makes the water itself potentially contaminable, but is more related to the diffusion process due to the fact that underground water sources can become contaminated. Human (and sometimes animal) excrement is what contaminates these water sources which cross-contaminate nearby well water sources. Given the right geological and pedological setting, the chemistry and vehavior of the percolating water can make a region even more susceptible to disease. Since alkalinity supports the tendency for vibrio (the cause for cholera) to thrive without immediate interaction with other digestive system settings, the vibrio can be “dormant” for short periods of time, residing in the water layers beneath the soil, waiting to be consumed by its next victim(s). Time is what makes the first two the three months of this diffusion process linear and appearing more like a human related or ship-ballast related problem. The disease migration process is not so much a pure case of “diffusion”, which behaves across x, y a z-axes, as it is a well-directed non-random migration process. To contagionists, this was proof the disease was human borne and directed. To non-contagionists this was proof it was ballast/ship cargo and climate/temperature/topography related. The final stage in the migration of cholera into a rural setting, due to its apparent multidirectional fashion, supports the belief that a pure case of x,y,z-axes migration is taking place, aerially. This model of the disease diffusion process blames family and domestic features for its ability to infect a group of people in a given household or closely knit community setting. Thus the cultural and lifestyle related cause is provided by these theorists, who in turn might even attach their own theories (inability to acclimate or adapt, susceptibility due to dietary patterns or local poor sanitation habits) to the causes for these local disease clusters. Two features for diffusion stand out: 1) transportation routes dominate temporally; in other words, critical temperature line for vibrio behavior outside the body moves northward very slowly, much faster transportation migration routes dominate; temperatures still dominate above a certain latitude (in northern states). 2) several easy to define hierarchical diffusion patterns are formed during the initial phases, based on the development of niduses for particular areas and the months that other nearby towns become infected. Initially there is a human-derived topographic, hierarchical diffusion route. Note the following: 1) the river defines the transportation rates and pathways, 2) niduses are formed based on urban centers– population density rules where ships land and commerce takes place, 3) cases stay very clsoe to the major migration routes. 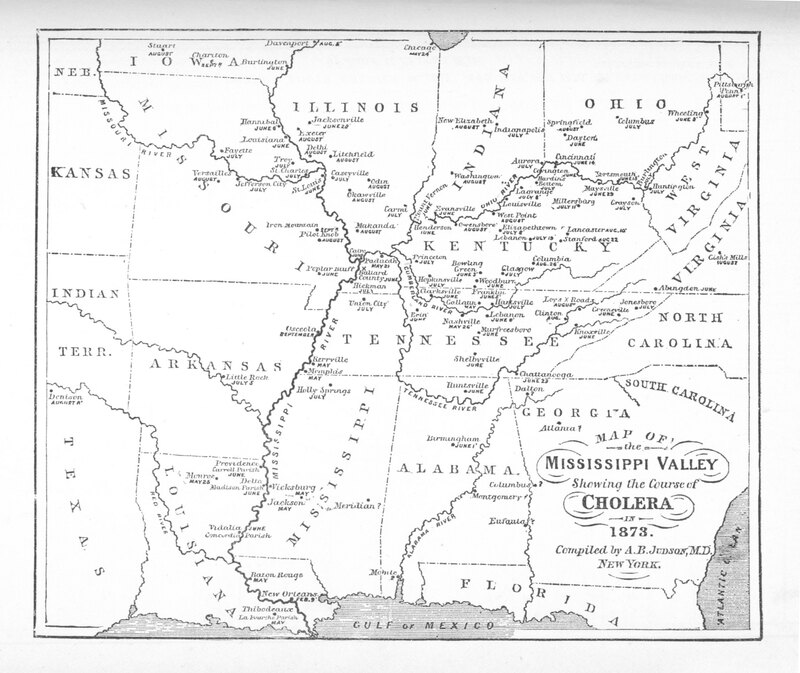 The original source or Nidus is New Orleans (star on map), which formed in February. Two months passed before human transporation activities carried the disease inland. During this linear and hierarchical diffusion process, three new potential niduses were defined based on dates of first infection (all of which have May dates). These sites prepare a location for the next stage in the diffusion process, making these sites the niduses for new secondary epidemic diffusion patterns. If a pure spatial diffusion process were to occur, we could use Theissen Polygon analysis to define the boundaries for these three niduses. Since transportation still plays an important role, and according to the map, hierarchical diffusions patterns still dominate in June and even July, a second series of transportation related migration/diffusion routes need to be defined, one for each month. Linear patterns for disease migration can be defined for dark red, red, and orange spots, in this order. Each nidus (circled) is considered a starting point, even though that actual case is the not the exact cause for all subsequent cases. The dark brown line is the primary diffusion route for May, which is hierarchical and has linear aspects due to the nature of human transportation behavior. The regular brown lines represent stage 2, months 2 to 3 (June to July hierarchical diffusion); the brown dashed lines are June to July (still hierarchical) diffusion patterns. Temporal features are still not significant, except for the limits they may place on northernmost areas infected when population density is very low. Cholera has two stages of survival–ecological and as a pathogen residing within the human body. The ecological relationship between vibrio and its animal (non-human) hosts requires a marine setting; an environmental supporting setting for vibrio lacks the host. but has a life supporting alkaline water body setting for vibrio to reside in between hosts. This large scale (large area) display of diffusion depicts three linear (human/disease migration events for May, June and July. The August migration is less precise, and appears to be more like a 3D diffusion process (due to “miasma”). Small area analyses would reveal a reversed hierarchical diffusion pattern within densely populated settings (see my Thesis on this). 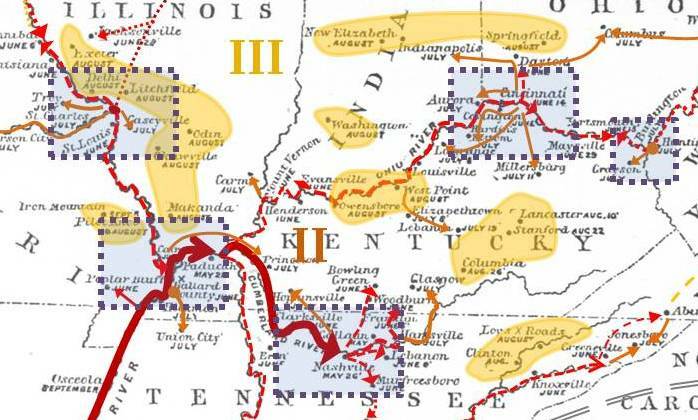 According to studies of proximal elevation above local water surface performed in the 1840s, topography did allow for some upper level income settings to be the first to develop the disease, but malnutrition and unsanitary poor living conditions prevail for the creation of these first cases (ibid). “Rich families” became sick because the organism successfully attacked the poor who tend to be more susceptible and then reinfected the local community or waters (others spatial epidemiology analysts may disagree with me on this statement). 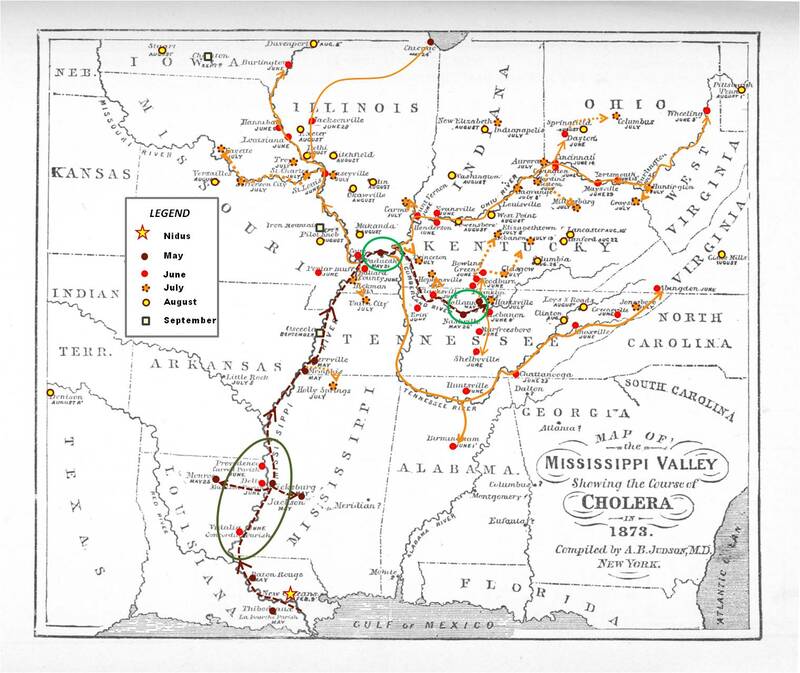 Regarding the map above, months 3 and 4, July to August, depict Stage 3 — the Inland Cholera diffusion process. Non-hierarchical spatial diffusion takes over. On the map this appears to be very 3-dimensional or cuboidal in nature, but in actuality it still requires human presence to take place, so it is still based on a human population feature even in the rural setting. Month 5 (September) has onely three points located, and represents the end points for this diffusion process. This place and time is very much climate/weather dependent due to reduced temperatures and lack of ecological support in preserving the vibrio organism in the right stage between cases. A more detailed mapping of the Cholera cases reviewed by Judson provides us with important insights into the human and natural ecological features of this disease. Each of these three Phases of disease diffusion have three major spatial feature types to consider: the points, line and areas (polygons). Phase I points are the entry point(s) for the disease, which in the above case are the New Orleans urban setting, and at least two other urban settings with high population density located further north. 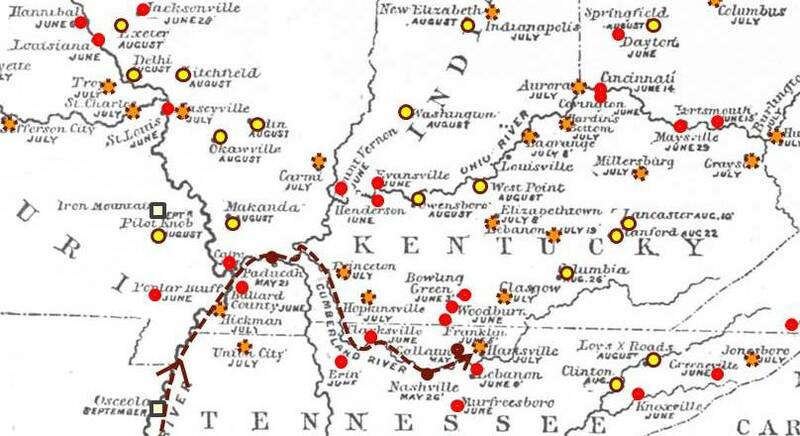 Whereas in the first interpretation of this map (prior section), just 3 major locations were defined for this form of analysis, this analysis defined at least two other potential niduses (depicted by the dashed border rectangles). This part of the diffusion process has its nidus-points and subsequent disease location points (most with dates). The Phase III point data are the points situated in the “wilderness” setting. These are the last of the individuals or population aggregates impacted by the disease. When viewed on the map, it is difficult to assign a linear feature correlating thes points to Phase II points, and so they become defined as areal or polygon features instead of point-line features. So long as population density and physiographic features are fairly evenly distributed, these area do have some well diffused features that can be used to define the spatial features they possess that made them prone to the disease, such as a human population density greater than zedro (an obvious requirement), the necessary environmental features for perpetuating the disease, and the required ecological features for harboring the bacterium between human-born cases. Line or arc features are most important in Phase I of the diffusion process, followed by Phase II. Whereas in Phase I this feature dominates regarding the placement of point data, during Phase II, the locations of numerous points each depend upon many of the same features as Phase I, with mroe dependence upon local human ecological features. In Phase I, the linear process is due mostly to transportation related features. It is the form of transportation and the speed at which this migration process occurs that dominate in the form this part of the disease map produces. The second Phase however has more dependency upon human population features and proximity of these features. This means that even though linear patterns (local transportation processes) are still required for this stage in the epidemic to be successful and to diffuse further, human population features and perhaps some environmental features become more the determinants for long term outcomes, spatially and chronologically. Phase III line/arc features are lacking from the map due to their inconspicuous and often untraceable nature. Transportation is obviously the method by which the disease diffuses or progresses from one region to the next, both this stage in the disease migration process is typically that stage which is least defineable and often very hard to predict. During this stage in disease diffusion, local environmental, ecological, climatic or meteorological, physiographic and demographic features play important roles. Areal/Polygon features for Phases I pertains to immediately local topography and physiography, and perhaps climatic/meteorologic features, in relation to the transportation route involved. In theory it is impossible for some diseases to progress into immediately adjacent regions without some sort of human contact with the disease carrying vessel. However, some evidence has shown that new hosts and vectors can be effective in transporting diseases from a vessel to a nearby population cluster, should the disease be transmissable by hosts or vectors, for example the diffusion of mosquito-born malaria, typhoid (“ship fever”) or yellow fever diseases. For a disease like Asiatic cholera, this diffusion process is also possible given the appropriate environmental and ecological features. The chemistry of the water, the presence of nearby alkaline soil conditions, the presence of an ecological host for the disease of possible inclusion in local dietary habits (estuarine or brackish water crayfish, crabs or fish), or the availability of enough people of considerable risk for the cholera (i.e. due to compromised diet or malnutrition, increase alcohol use, etc., see thesis notes). Generally speaking, the areal feature of the transportation route must have the right hydrographic requirements, such as a riverside route, or a land route along which there are enough population density features (the feature of military routes). Phase two areas have requriements matching those of Phase I, but also include a higher emphasis on human and natural ecological features. Human ecological and transportation features define the route of migration and places where secondary niduses can develop. Natural ecological features help to define those niduses and more importantly define their stability as a location where recuring births of new case clusters can ensue. Examples of these Phase II area are found along the Oregon Trail such as Fort Kearney, where human population features dominate, but local pedological and hydrological features enable the disease to remain viable for short periods of time between human cases. This viability is due to warm temperatures, permeable alkaline soil (latrine-well and cross-well contamination) and alkaline water (vibrio ecology). Phase III areas mimic the Phase II areas, with the exception that human population density is low, and so potential human victims are sparsely located. Two things enabled these places for vibrio outbreaks to exist–adequate vibrio ecology between cases, or very active disease diffusion or transportation features enabling disease to migrate from one region to the next fast enough to cause another outbreak. 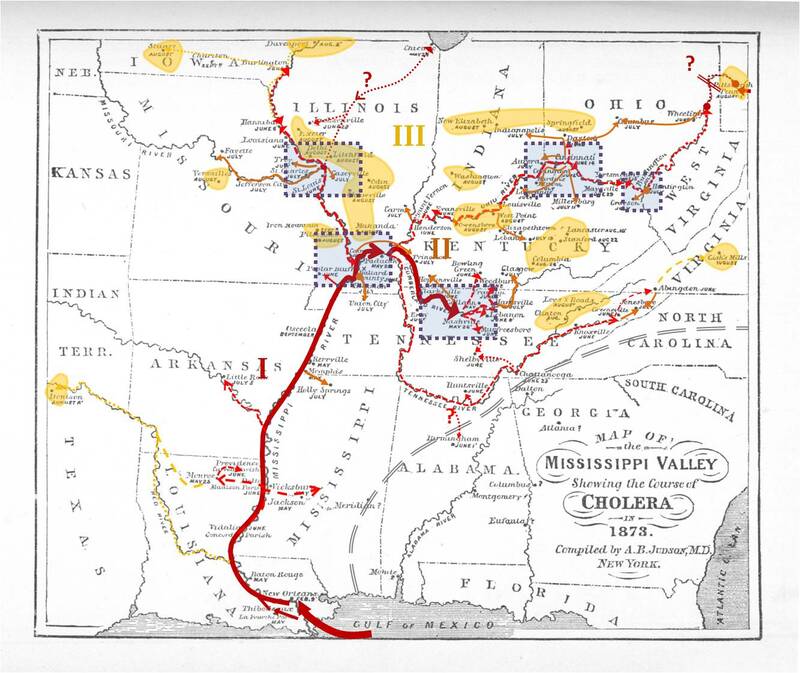 In the map depicted, Phase III area have both water and land transportation routes. The limiting factor to how far a disease might be carried along these routes is the distance between the first Phase III point and the next Phase III point. Too great a distance may prevent the vibrio from being able to re-erupt at the new end point due to its fatality or the conclusion of its own stages of infectivity due to the passage of time since the last human victim. Isochrons based on month. [May=dark boundary, June, July=white background, within dashed line, Aug + Sept=outside the dashed line; the Mississippi delta data of origination in New Orleans is February 9th]. Diameters of niduses are based on local population counts, but are still very subjective. An isoline interpretation of the above is interesting. Judson has provided enough point data to produce an interpretation of the disease diffusion process. However, this isoline/isochron interpretation could have several more points evaluated, especially those with more details of exact dates. The general assumption made here is that there is a perfectly linear process taking place in the diffusion process, following routes that could be evaluated using a Network Analyst ArcGIS extension. 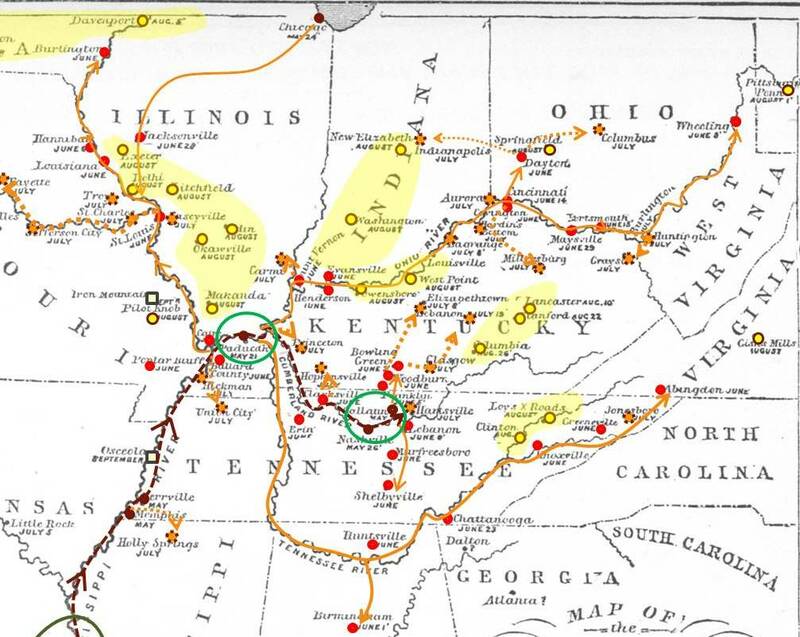 This evaluation was made in part based on the dates noted at some of the points on the original map. With the passage of time there is also the northward migration of the critical isotherm line indicating when vibrio would begin to behave more as an ecologically based epidemic and not just a direct contact related epidemic requiring person-to-person transfer. Based on the analysis of the points above, we could conjecture for example that during the months of May and June, the movement of the warmer isotherms northward as the season progressed also enabled the disease to impact the morth northern towns and cities. During these months, much of the disease spread process was linear. During the month of July, a different type of disease behavior took over. As the disease began to spread, it took a more diffuse route in all directions, but still adhered to human migration routes since humans were its primary victims. During the month of August on the other hand, due to warm temperatures, and ecological setting more supporting of the vibrio outside the body was developed, enabling the organism to reside dormant for short periods of time between human victims, residing in seasonally warm soils and water bodies. One of the problems with this map is the uncertainty about where to place island polygons, or the appropriately sized polygons depicting isolated regions around a local nidus for the epidemics. These niduses do not bear the same date. Some occurred in late May, others in June. Adding to the complications of this time-distance problem are the various assumptions that have to be made in producing this map. We cannot be sure for example if Judson was able to obtain the details about every case. This kind of map is also an example of maps that can be produced with the goal of making a political statement. Since this map was manually produced, the location of many borders is fairly subjective, and may be interpreted by one reader as a potentially opiniated interpretation of the outcomes. 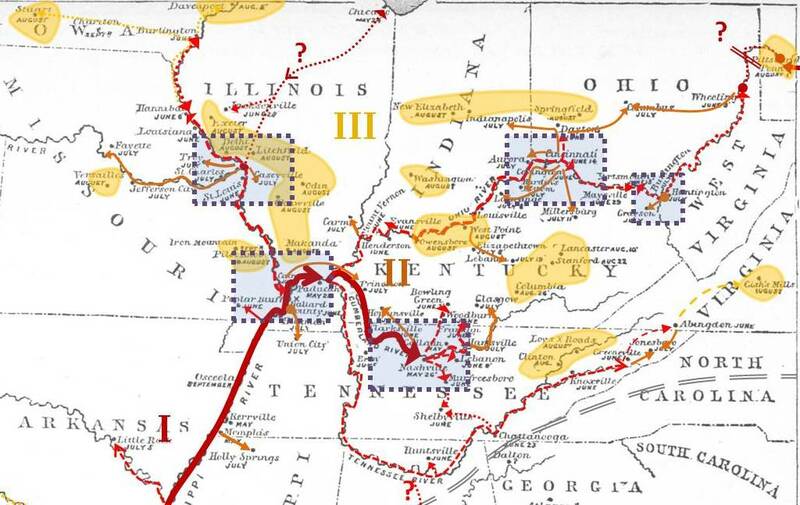 This feature appears in many of the maps published in medical journals, ranging from the classic map on zones of disease provided by Alexander Keith Johnston to the map of cholera regions for 1866-7 and 1873-5 by another medical geographer cited in many of the works for this period of time–British medical cartographer Mr. Netten Radcliffe (reviewed on another page). A considerable amount of information is provided on Judson’s studies used to produce this map and the results of these studies. There were several versions of this study published. My personal copy is Edmund Charles Wendt’s A treatise on Asiatic Cholera, 1885, Wood’s Library/William Wood and Company. The Government Documents also contains a copy of Peter’s work, as well as a couple of separately published books. Most of these original sources can be found in Google Books [click for LINK].